Oh, What a Night Out! What a night! Thanks to all who made this year’s Night Out gala an unprecedented success. Hundreds of community leaders, sponsors, and donors came together to honor leadership, celebrate, and give very generously to help ensure we can sustain and expand our critical work. We kicked off the evening by honoring Salesforce, Assemblymember Evan Low, and Abundant Beginnings, for their exemplary work as allies and champions on behalf of LGBTQ families and the broader LGBTQ community. 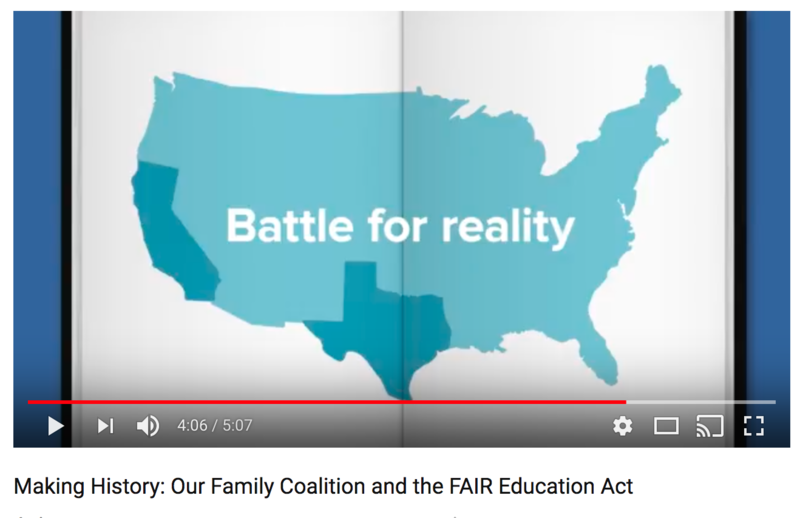 At Night Out, we also premiered our 2018 video Making History: Our Family Coalition and the FAIR Education Act. Please take a look and let us know what you think! I hope you’ll be inspired by our Coalition’s efforts to advance LGBTQ-inclusive education in CA. As you know, OFC is in a critical moment in our work and in our movement to advance equity for LGBTQ families and our children. We have accomplished so much in the face of a hostile political climate and know that our efforts are needed more than ever as we face daily threats to our hard won gains. 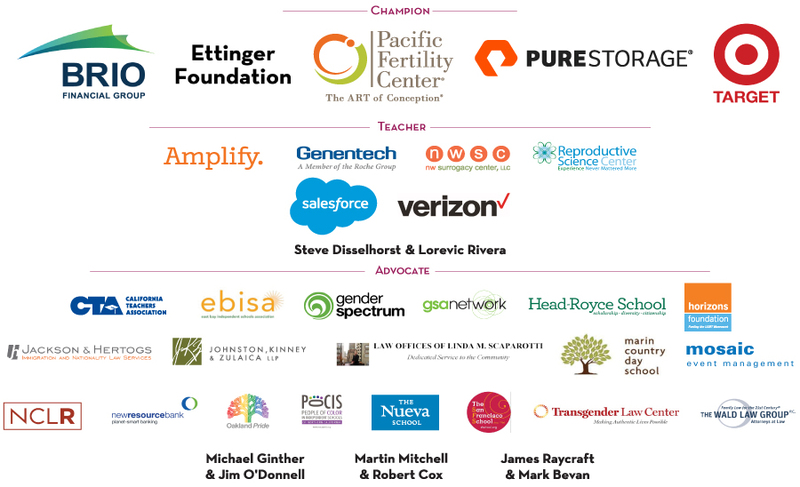 We thank our generous Champions whose support helps make our work possible: Brio Financial Group, The California Endowment, Ettinger Foundation, Kaiser Permanente, Pacific Fertility Center, Pure Storage, and Target. We also express deepest gratitude for all of our sponsors and donors. Please visit our website to check out the stellar list of Teacher and Advocate-level sponsors as well as more details about our honorees. Finally, we are excited to report that the donations in the room exceeded our goals, and we will honor this generosity through continued, vigorous advocacy, education, and community-building! Your generosity and commitment has and will continue to help make all this difference. P.S. If you were not able to join us at Night Out, please enjoy it vicariously by checking out our online Night Out 2018 photo album. And we invite you to give what feels good to you. All funds benefit LGBTQ families, our allies, and the millions of California schoolkids who will be learning LGBTQ-inclusive history because of your support. This entry was posted in Night Out, Our Family Coalition Events on May 16, 2018 by Our Family Coalition. Yesterday the Trump administration took another step toward conservative, evangelical theocracy. Thanks to a sensational news day, this year’s declaration received less attention than last year’s “Executive Order Promoting Free Speech and Religious Liberty.” But it’s no less concerning, since it continues to embolden and empower those who would weaponize religion against constitutionally recognized protections, pointedly of LGBTQ people and our families. Overlooked in so many treatments of this subject is the fact that 81% of Americans believe the law should not allow companies or other institutions to use religious believes to decided whether to offer a service to some people and not others (per the ACLU, here). Likewise overlooked is the fact that a majority of LGBTQ people nationwide consider themselves active members of a faith community, most of them Christian (13% Evangelical, per the 2014 Pew Religious Landscape Study here). That said, LGBTQ Americans are far more likely to be “unaffiliated” with a faith than other Americans. And too many of us have experienced exclusion from faiths in which we were raised. None of this dampens the vibrancy of the many open and affirming congregations that are home to so many of us. The application of “religious liberty” arguments thus far have proved that these gestures are designed primarily to provide cover for unconstitutional denials of service (details in the recent report, Religious Refusals in Health Care: A Prescription for Disaster). As always, we’ll remain alert along with our allies, and confident that our greatest power lies in our love. Please help us amplify the true stories about our families and our faiths. What do you believe in? What does freedom for and freedom from religion mean to you? 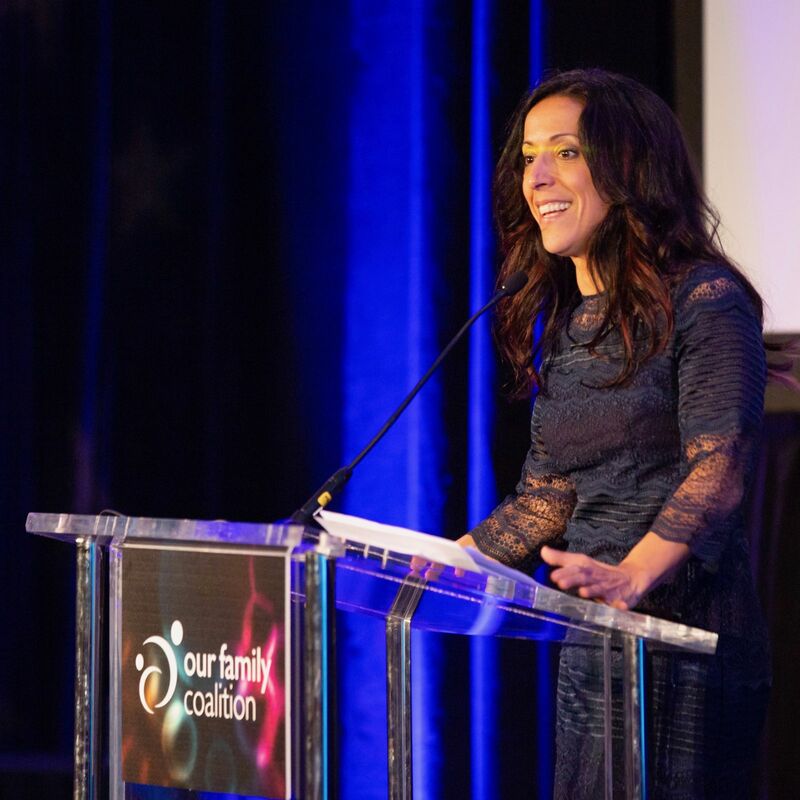 Send us your words or join the Speakers’ Bureau; contact us at media@ourfamily.org. This entry was posted in Uncategorized on May 4, 2018 by Our Family Coalition. Night Out is a party with a mission. Sure, it’s a night of festivity, food, and fellowship. But we’re also there to party with a purpose: we celebrate our wins over the past year, and we marshal resources for our work in the year to come. And perhaps most important, we express our deep gratitude to the people and organizations who have championed LGBTQ families over the previous year. Salesforce Outforce members carry the Salesforce #EqualityForAll banner at San Francisco Pride. We are honoring Salesforce as our private sector Ally this year, and for very good reason. The company is committed to equity and inclusion in the workplace, earning a number one ranking on Fortune’s “100 Best Companies to Work For” as well as Indeed’s “Best Place to Work” list and the Employee’s Choice award on Glassdoor’s “Best Places to Work” list. With approximately 20,000 employees, that adds up to a lot of LGBTQ parents and caregivers experiencing a strong, supportive workplace. But Salesforce’s allyship goes even further than this. Their workplace equity advocacy is exemplary, with clearly articulated equality-driven values, and a record both of supporting LGBTQ relationship recognition and of fighting attempts to roll back protections of LGBT Qpeople in the states which have been doing so, signing a friend of the court brief in the Masterpiece Cakeshop case, and going so far as to cancel all corporate travel to Indiana and subsidize LGBTQ employee relocations when it proposed its Religious Freedom Restoration Act. Naturally, companies are going to stand for equality and non-discrimination in the workplace. That is imperative. We are also dedicated to standing for equality in the communities where we serve not just our own interests but for the interests our customers, the interests of our partners and for the interests of our employees and their families. My son is a proud LGBTQ advocate and a member or the LGBTQ community. I’ve been on this journey with my son as a father and I’ve come a million miles on that journey with all the things that I have learned and seen through the eyes of my son how it feels to be LGBTQ. When you hear statistics, there are abstract numbers — thousands and millions. But when you see one person that you love and you’re putting yourself in their shoes, you see how they’re experiencing life and the things that they celebrate and the things that cause them great heartache, how it feels, those are things that change your life. Allies like this indeed change our lives. Join us on May 11 to help celebrate and give thanks. And if you have even more to give: some sponsorships are still available: contact jenny@ourfamily.org or call 415-981-1960 for more information. This entry was posted in Announcement, Night Out, Our Family Coalition Events and tagged allies, night out, Salesforce, Tony Prophet on April 18, 2018 by Our Family Coalition. Guess who’s being honored in this year’s SF Pride Parade? Our Family Coalition is honored to be among this year’s San Francisco Pride Community Grand Marshals and Honorees! 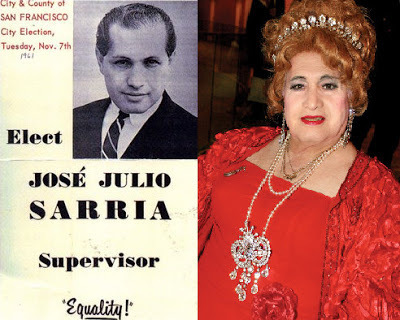 We will be accepting San Francisco Pride’s José Julio Sarria History Maker Award * on behalf of the FAIR Education Act Implementation Coalition, for which we’re the convening and lead agency. We’re honored to accept the award on behalf of our many FAIR Education Act Implementation Coalition partners: The Committee on LGBT History, GSA Network, the LA LGBT Center, the National Center for Lesbian Rights, Equality California, the Safe Schools Coalition, and leaders such as Don Romesburg, Carolyn Laub, and Judy Appel, who worked hard in or alongside Our Family Coalition for years to get LGBT history into CA’s textbooks. This entry was posted in News and tagged inclusive schools, sf pride on April 12, 2018 by Our Family Coalition. Join us at our Night Out Gala on May 11th! Announcing our 2018 honorees. It’s time for another Night Out! For ten years, Night Out has been the only event exclusively supporting LGBTQ families with children in the Bay Area. Night Out brings together hundreds of the Bay Area’s most committed leaders and partners in the LGBTQ family justice and education movement. Elected officials, corporate sponsors, community partners, and major donors gather together to celebrate our families and our accomplishments, and marshal the resources for Our Family Coalition’s future. On Friday, May 11, 2018, at 6pm, we’ll gather and celebrate at the InterContinental, San Francisco. Will you join us? Early Bird tickets are on sale through midnight April 15. Tony Prophet, founding Chief Equality Officer at Salesforce, will be receiving our Ally Award on behalf of Salesforce for their work advancing gender, LGBTQ, and racial equity at Salesforce and beyond. Evan Low, California State Assemblymember representing 28th District, will receive our Luminary Award for his work advancing equity for LGBTQ Californians as the co-chair of the California Legislative LGBT Caucus. Shayna Cureton, of Abundant Beginnings, will receive our Community Partner Award on behalf of their team for Abundant’s amazing activism work to create social change in our schools and our communities. At Night Out this year we’ll also be launching a thrilling new Emeritus Board that will harvest the brain trust of OFC’s over twenty years of change-making and support. Stay tuned! We offer our thanks to the dozens of leading companies, organizations, and individuals who have already committed to making this year’s event a huge success, including Brio Financial Group, Ettinger Foundation, Pacific Fertility Center, Pure Storage, Target, and many more. Sponsorship opportunities and benefits are still available! Please email Jenny@ourfamily.org by April 20 if you’d like to join these visionary advocates for LGBTQ families. It’s an evening of inspiration not to be missed. I’m looking forward to welcoming you on May 11th. This entry was posted in Announcement, Night Out, Our Family Coalition Events and tagged night out on April 4, 2018 by Our Family Coalition. We at Our Family Coalition are taking a long look at the local and national landscape, the work we’ve been doing locally, and the work that’s ahead of us. For over 20 years, we’ve been guided by a mission to ensure that LGBTQ families in the Bay Area and beyond get the resources, training, support, and advocacy they need to enjoy legal and social equity, visibility in our culture and our schools, strong bonds within our communities and with our allies, and strong families – regardless of who we are or where we live. The Spice Girls, imploring as only they can. So, tell us what you want – what you really, really want! To help us focus this vision and set our course. What direction do you think we should take? What issues, projects, resources should we put our efforts into, to make your family’s life fuller and more free? What matters to you most, what transformations in LGBTQ and LGBTQ family community feel the most pressing to you? WE’VE GOT JUST THE SHORT SURVEY FOR YOU! It’s short and sweet (an episode of your favorite show would take longer), and though it’s anonymous, you can choose to enter to win a $50 VISA gift certificate if you share your email and are open to follow-up questions. This entry was posted in Announcement on March 15, 2018 by Our Family Coalition. New GOP “license to discriminate bill reintroduced.” Act now. The GOP is bound and determined to use the calamity of Trump’s presidency and their current House and Senate majorities to do as much damage to our communities as possible. Yesterday brought another very consequential threat, and it must not go unnoticed. commercial landlords could refuse to provide housing to a single mother. They’ve been at this for years, but ramped up big time when Trump took office. With last year’s Justice Department guideline on “religious freedom,” anti-LGBTQ discrimination became more than tolerated: it’s receiving tax advantages. The recently established federal “Division of Conscience and Religious Freedom” is meant to accomplish the same aims. So now, GOP senators have re-introduced First Amendment Defense Act. It’s a body blow to LGBTQ people, to the separation of church and state, and to our constitutional democracy. We at Our Family Coalition join with hundreds of partners across the state and nation to push back against ill-informed leaders who use religion as a weapon to hurt LGBTQ families and communities. We cannot allow our communities’ rights to be rolled back to medieval times. Let us take action, let us pool our resources, and let us be guided by our love – of our children and of justice. This entry was posted in Action Alert, News on March 9, 2018 by Our Family Coalition.